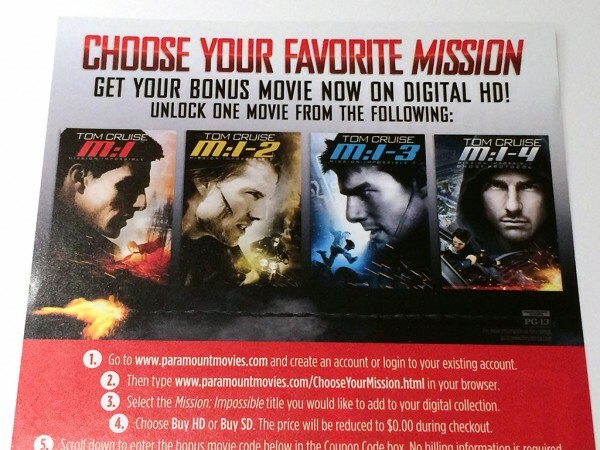 If you’re one of the many who purchased Mission: Impossible Rogue Nation on Blu-ray Disc you may or may not have noticed the paper insert that includes a redemption code for a Digital HD copy of one of the first four Mission: Impossible films. The expiration date, 2/15/16, is just weeks away. This isn’t the UltraViolet digital copy redemption code provided for Mission: Impossible Rogue Nation, but rather a separate offer that ends much quicker than the UV code. The code provided on the insert works like a coupon. You go to the Paramount Movies website, choose the film you want (M:I 1, M:I 2, M:I 3 or M:I 4), proceed as if you want to buy it, but enter the coupon code before purchasing. The cart will switch to 0.00 amount owed. They do ask for a credit card or PayPal account, however. And, you need to have a an account with Paramount Movies and be logged-in for it to work. The redemption process is a little clunky from Paramount (we experienced several problems while trying to validate credit card and PayPal information), but considering the cost of these movies in HD are as much as $17.99 each it’s well worth the effort. Tip: If you already own the SD version of one of the films, the Paramount Movies code will upgrade that title to HD at no charge. And, the title will show up as HDX with Vudu or HD with UltraViolet supporting services. Here’s the link to Paramount Movies and the free bonus film. Be sure to have the insert with code in-hand. Can you redeem more than one coupon? I redeemed my first coupon for MI:2 and I’d like to purchase another code from a friend to redeem for the third movie.